Sam Hinkie and the 76ers were non-factors on the free agency market this summer and instead chose to add to their roster in other ways. With the No. 3 overall pick at the 2015 NBA Draft Hinkie added Jahlil Okafor, a 6-10, polished post player with an NCAA championship ring. Okafor showed some flashes of greatness during summer league action in Las Vegas and it appears that the Sixers have another solid player to help rebuild this franchise. The other news worthy addition was shooting guard Nik Stauskas who came to the Sixers via a trade with the Sacramento Kings. Stauskas had a disappointing rookie season in Sacto that featured limited minutes and a coaching change. He also did not suit up for the 7-6 at the 2015 NBA Summer League. Thus Stauskas and exactly what he can do for the Sixers remains somewhat of a mystery for Philadunkia nation. 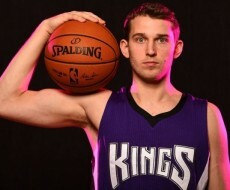 In an effort to shed some light on what can be expected from Stauskas this season, I reached out to several of my NBA contacts as well as Jason Jones, the Kings beat writer for the Sacramento Bee. For your reading pleasure, I present their inside analysis on Stauskas. Philadunkia: You saw Stauskas on nightly basis last season. What impressed you the most about his game? Jones: It’s hard to say what impressed me about Stauskas most of the season. He admittedly struggled with his confidence and spent most of the season in a slump. He showed flashes of being a good shooter, but his playing time was inconsistent and he had to play for three coaches. At his best, Nik plays with a swagger that can be infectious. Philadunkia: Stauskas was a highly rated player in the 2014 Draft and a number of teams inquired about trading for him this summer. Thus it would seem that NBA types believe he can contribute in this League. So what kept Stauskas from getting significant minutes in Sacto as a rookie? Jones: Stauskas didn’t play much because he wasn’t playing well when he did play. He seemed to have more confidence in summer league and early in the preseason. He was struggling with his shot and defensively. A lot of the struggles had to do with being a rookie, but the Kings’ unstable situation last season did not help him at all. Philadunkia: Stauskas is entering his second year in the League and he obviously has some elements of his game that need improvement. From what you saw/heard in 2014-15, does he have the work ethic and drive to push himself to further develop his skill sets? Jones: One of the concerns about Stauskas was whether he knows how hard he has to work to succeed in the NBA. But in his defense, he didn’t have an environment conducive to learning how to succeed last season. But I think he can show the work ethic next season. Philadunkia: The stats indicate that Stauskas’ play improved during March and April. Was it simply a matter of increased minutes or did you notice a change / some development in his game? Jones: Increased playing time and George Karl’s style of play helped Stauskas’ numbers improve late in the season. He felt that style fit him best, because the ball moved more and it allowed him to be more of a playmaker. He looked more relaxed at the end of the season, too. The disappointing rookie season Stauskas has last year was partly to blame (but not totally) on the fact that he played for the Kings, one of the worst run organization’s in the Association. We all know that Stauskas has a great jumper, but he showed signs last year of developing an ability to create his own shot. He’ll never be a 1st, 2nd option or possibly 3rd option on offense and if he succeeds with the Sixers it will be as a role/complimentary player. Obviously Stauskas has yet to reach his full potential and those who know the game seem to believe that if he is going to develop and take his game to the next level, that 76ers are a team that can help Stauskas get there. Thanks to Jason Jones for his time and answers. You can follow him on Twitter @mr_jasonjones.